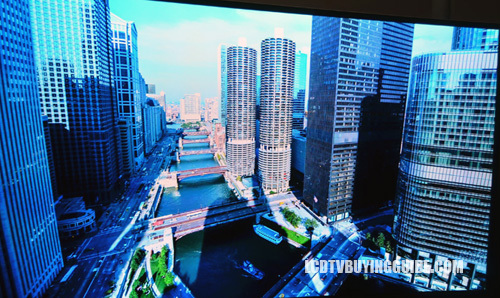 The UN65HU9000 is Samsung's entry into the curved 4K LED TV realm. It is as good as it gets without stepping into OLED territory for 2014 Samsung LED TVs. It sports all of the features a top tier TV should have. Smart Touch remote, Active 3D with dual view tech, 4K upscaling, quad core plus processor, and plenty of HDMI 2.0 inputs for all of your 4K enabled devices. The curve of the screen is supposed to help with viewing angles and creating an overall more immersive experience. This one retails for about $5,000, which is only $500 more than last year's flat 4K F9000. Prices for this picture technology are falling quickly. As far as 4K LED TVs go, we have seen the typical problems present in most LED displays. This TV is no different, but it is one of the strongest in the market when it comes to LED edge-lighting. The powerful LEDs really give the HU9000 a step up in terms of black levels and peak whites. The 65HU9000 has best in class color and contrast that create superior images with excellent light flow through. Images on screen are crisp, and refined compared to some of the other LED TVs out there. The Ultra Clear Panel does a lot to improve the picture quality on the 65HU9000. 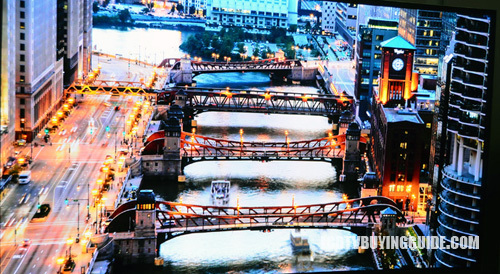 The most noticable improvement is the reduction of reflection and absorbsion of ambient lighting. LED TVs really shine in bright rooms, but relfection tends to be an issue. These Ultra Clear Panels take care of that problem without creating a soft and shallow picture like we see on many matte screens. Light flow through is another adavantage of the clear panel. This really highlights brightly lit areas of the screen without hindering dark areas. The resulting image looks very realistic and remains the way it was intended to look. With every big tech purchase we ask ourselves, "will something better come out next week or next month." That is especially the case with televisions. Samsung has addressed this issue in their other smart TVs with the evolution kit. This kit upgrades the internal hardware to bring the TV up to speed with the latest software and performance upgrades. The HU9000 is no different, especially since the widespread distribution of 4K content is still on the horizon. The One Connect box is basically the same as the Evolution Kit, but with a focus on 4K distribution and playback standards. The box will be available in 2014 and will also add features, content, and provide performance updates to the HU9000. 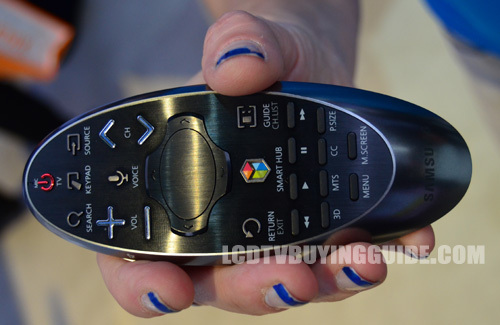 Surfing the web and the Smart TV features is a breeze with the new touchpad remote. It's much faster and easier than a traditional 5-way controller. The actual touch pad is a bit smaller this year, but that's okay because it now supports motion control. 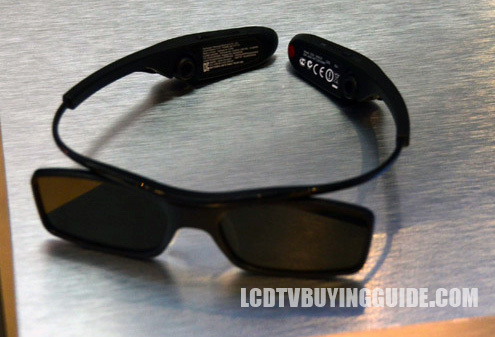 This brings it closer to LG's Magic Remote. The smaller touch pad also leaves room for more useful buttons on the remote instead of the on-screen menus. The voice recognition only works for inputting searches if the soft keyboard for the search field is open. 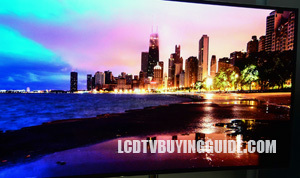 Many people decide to wall mount their new super thin LED TVs. And why not? These almost frameless displays look great hanging in the living room or home theater. One of our big questions about these curved TVs was: How will they wall mount? Well, the HU9000 does fit the 400 x 400 VESA wall mounting standards. That's a relief since 3rd party (i.e. less expensive) products can be used. Samsung however, does provide some low profile proprietary hardware as well. The Samsung WMN450 Mini Wall Mount will do the trick for this TV too. Samsung really embellishes the curve of the HU9000 series through the design. Though the curve of the screen is slight, the curve of the silver T-shaped stand really grabs attention. The screen looks like it's floating from a front on view, so the stand isn't too intrusive in terms of the overall appearance. It features the clean back design that we have seen in the past. The 0.3" thin bezels, silver finished frame, and the hidden away pop out camera top really make for one stellar looking TV. The HU9000 is a little hard to swallow when it comes to value. It starts at five grand for 65 inches of screen space. You do get every single picture quality upgrade that Samsung has to offer this year. That's the best part. The downside is that we don't see a significant enough side angle viewing improvement from the curve of the screen. 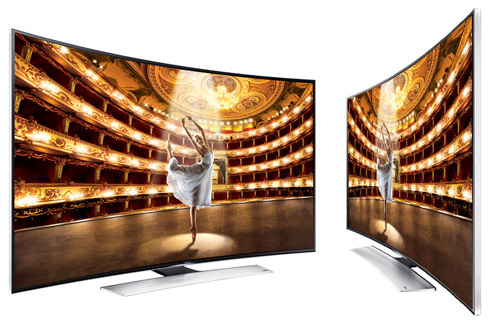 Check out the Samsung UN65HU8550 if you are interested in a flat 4K LED TV. The Sony XBR-65X850B sells for $1,000 less but without the curve. Without Stand: 57.1" x 33.4" x 4.4"
With Stand: 57.1" x 35.1" x 12.9"
Weight without stand: 59.1 lbs. Weight with stand: 68.3 lbs.